visalia – For the first time in Samantha Hilvers’ three years at Exeter, she’ll go into the second round of Central Sequoia League play with a win over Central Valley Christian. That is only after the Monarchs ground out a win over the Cavaliers 3-1 (25-23, 25-19, 23-25, 25-22) on Monday night, Sept. 10. 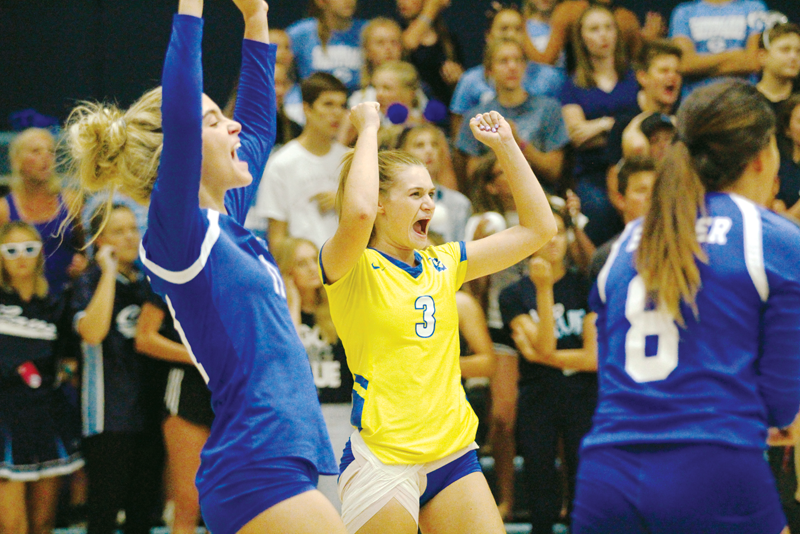 The CSL rivalry between Exeter (12-4, 2-0) and Central Valley Christian (4-8, 1-1) on the volleyball courts is one which needs no flamboyant adjectives. The past two seasons Exeter and CVC have either shared or won the league title outright. In fact since both teams joined the CSL in 2008 no other team has won a league title. That trend seems like it will continue as both teams combined for 187 points. Neither the Monarchs nor the Cavaliers were able to distance themselves from each other by more than five points all match long. In the first two sets Exeter pushed through and won, but it was a series of mistakes that brought on unsettling nerves late in the third set which cost them the sweep. The fact CVC continued to find ways to hang around coupled with the Cavaliers’ student section made it difficult for Exeter to close out the match. “We had to zone that student section out, so I just told them, ‘to take their time,’” Hilvers said. After CVC got on the board with the win in the third set and tied it up 20-20 in the fourth it seemed like Exeter was going to have to play a fifth set. That was until Grace Germaine scored the game winning kill. Exeter’s offensive power hitters, Corinne Acosta and Teagan Bryant, both had big nights. But the Monarchs have an emerging force in the middle of the net in Julia Nelsen. She played opposite for the Monarchs last season and has made the switch back. She finished with four kills and two aces on the night. “Tonight was the first time we got to see her play like a true middle,” Hilvers said. With two CSL wins to Exeter’s name they are in the midst of a six game winning streak going back to the Clovis Challenge. Last week they added wins four and five to that list. The fourth win came in a 3-0 (25-19, 27-25, 25-21) result over the Clovis East Timberwolves. Acosta led the Monarchs with nine kills. Win number five was in their CSL home opener. They defeated the Immanuel Eagles 3-1 (25-14, 22-25, 25-11, 25-16). Acosta also led the Monarchs with 19 kills. On Wednesday, Sept. 12, the Monarchs continue CSL play at home against the Selma Bears at 6 p.m.